Wow, it's sunday 2:35pm and this weekend is getting much much better already. One of the things we needed to do was print out some prayer cards. We snapped a photo in PNG, used our mac to turn it into a prayer card, then came here, signed up for walgreens photo... no idea they offered free 25 prints.... and the photos were available the same day for pick up. Still it will get better as I get to see my grandmother tonight, which I'm excited about. Friday, friends drop in... been years since I've seen his kids. 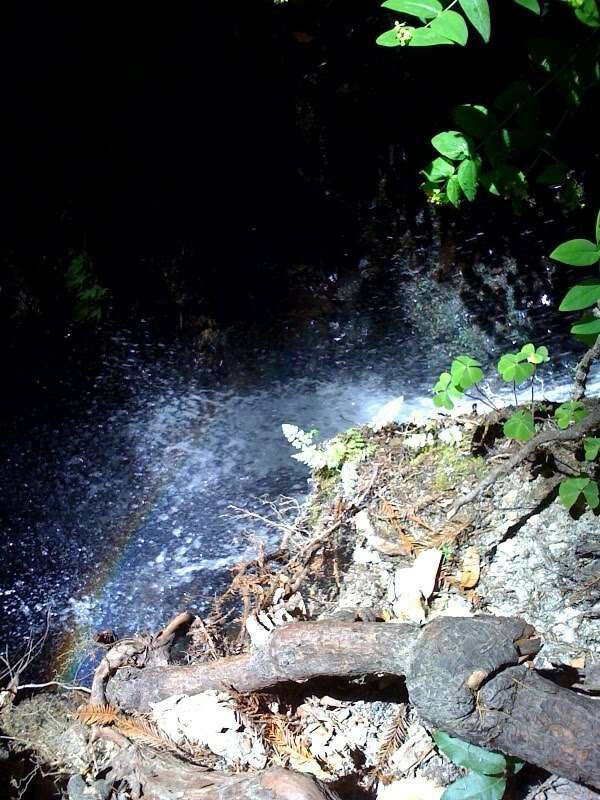 Saturday, we go geocaching and hiking with friends, at one point I was half way down a water fall hanging on to roots!!! Then we ordered pizza, and had ice cream for dessert! Their youngest daughter held my hand for some reason which was sweet. Sunday I sat in church next to my cousin. A wonderful, awesome, first for me. Then we introduced ourselves to a new neighbor and got invited to come speak at one of her gatherings. What a GREAT weekend this has been... a little of everything! We got outside an hiked, spent time with old friends and family, ate good food, experienced worship with family together, praised God for that, and also were given the chance to talk about our ministry! WOW... God is good... thanks to those who have prayed for our rejuvination. I feel better in spirit today than we have in a while. It was a big surprise how good for the soul these things are. We new coming back there would be things we said or that our kids said that may sound awkward or bad. We tried to train the kids not to say those things but also decided to give them one less thing to worry about in transition, to not hound them about it. "your children said a word that I don't think would go over very well here... I thought you should know." there are several words in their vocabulary that are not Politically Correct for one reason or another. We live and work in a country with multiple cultures, and American culture is one of the most politically correct countries in the mix. One of the acceptable terms for a Papua New Guinean is 'blackskin'. They call us whiteskins and themselves blackskins. It sounds racist and rubs an American the wrong way as it did us for a while... until our kids got used to it in hearing the other kids talk. Here of course that would really rub someone the wrong way. One term we no longer use is 'native'. In training we were taught 'national' was more appropriate. language works both ways now. We'll say things that will offend here, and hear things that would offend there. The key is... to try and avoid taking offense, assume the best, and put on a learning spirit... ask questions... and that is how we avoid conflict. So please, if we say or do anything you find offensive let us know, it'll be a learning experience for both of us... we definitely don't mean to offend. And so I thought about why. First we are living in a very relaxing, quiet, and isolated place for this home assignment. That may be everything right there. But one of the kids mentioned that we weren't being watched 24x7 as well as is what happens when you're a ex-patriot with white skin living in PNG. I've been told that PNG is a pressure cooker, that the pressure slowly builds and builds until you get used to it all around you and that you don't realize it until a furlough. I hadn't noticed feeling any pressure. It hasn't been a super easy 3 years but I never felt over stressed. Here, I think it took 3 weeks but I've let my guard down a little bit... I'm not always looking over my shoulder, I can let my wife go somewhere alone. I feel relaxed... and I really am enjoying this rest. Years ago, 1997 I am a system admin at Sun Micro. I have to move from building to building working on issues, and never really 'customized' my desktop because of this. I once sat down and during a server emergency, saw another admin spend 20 minutes customizing his desktop so that 'he could work'. Before that time I had always been the kind of guy who didn't customized his computer in anyway. No stickers, no ergonomic keyboard, no backgrounds, no special sounds, no keyboard remapping, nothing. After that day I was stalwart in my beliefs. Now, being a missionary I'm more nomadic and it's paying off. I can work as quickly on any keyboard, any laptop, with or without a mouse, with or without a trackpad or trackpoint or whatever. I have no customized sounds or space that I require. And I find, that because of this, I'm quite content working from this little laptop without any kind of external devices. And I've found in the last week that looking down at my laptop screen is in fact putting a crick in my neck. I've never been very caring about ergonomics for myself. I can see how it helps others quite a bit, and it's important to be comfortable in your workplace. I suppose my comfort comes in knowing that I can jump around and be as productive one place as I am another... well relatively speaking. The only reason I bring it up, is it seems that this penchant for non-customizing and it's payoff to my nomadic lifestyle... seems to be another example of God working in my life years ago to prepare me to be what I am today. He reminds me of these little things from time to time... these 'oddnessess' that are parts of my personality that eventually come to bear to have some actual functional use in my life as a missionary. It blows my mind how perfectly God suited me to do what I'm doing right now. who isn't, this day and age? We got a prepaid telephone from t-mobile.... to keep our telephone bill down. I'm guessing they recycle their phone numbers, as most places would. This phone is free to have and costs $1.00 per day it's used. So we try not to answer it if we don't know who is calling. We've been getting wrong calls for Amanda Garcia. Some from men who speak... seductively.... to which I'm always tempted to say 'hey meet me in that place we were once at midnight'. But I haven't yet. Once it was someone trying to buy something and I was tempted to get their credit card information. If for no other reason than to cover my phone bill. AT first we thought it was some single gal giving out fake numbers to guys in bars. But today a debt collector called. I resisted the urge to say 'try and find me! Freeze all my assets, I don't care... Johny LAW!!!!" But we haven't..... not yet. So far, the toll is $6.00 we've had to paid simply because of these wrong numbers. 4 years ago I bought a gadget. For work, I spent $99 and bought the Airport Express for the sole purpose of having wifi wherever I went. I think in the end, work reimbursed me for the purchase as well. The unit was small and it worked well, so I took it to PNG with me. There I didn't need wifi, but I found that if I made it a wifi client I could plug a stereo into it and share my itunes out. So I did. Then I came back to America and took it with me. Again I had no need for wifi, but also no need for itunes to a stereo, but I did have a need to make a printer networkable... or storage central. So I plugged a usb printer into it, and with almost zero configuration, it was working again. this little device I bought 4 years ago, has now graduation to being something I take alongside my laptop if I'm to be anywhere for longer than a month. It's very handy, and I had no idea what I was buying when I bought it, I simply wanted a cheap and highly portable wifi spot. It has served me well over the years. And I thought it worth mentioning because good products are hard to come by. this is a bit of a rant... but not an angry rant. I live in Papua New Guinea. Land of short men. I stand at 6'5" tall. I knew this before moving there. What follows is not a list of complaints, I love being tall, and all its advantages. I know there are many men out there who would love to be this tall. Instead this is a list of observations... while I would not change me, I may at times wish to change the world around me. That's why furlough held the appeal to me of finally blending into a world where I fit in. -while no one is surprised by my size, there are still a few things off. -higher counters are nice for me. -still people mount mirrors so I can only see from my neck down... which makes it hard to shave. in the USA I fit in about 20% of cars. That's right, I had to turn down 2 free car offering because I could not fit well enough to drive them. The reason for this I think is that in PNG a majority of cars are older and are 4x4's. There are no nice street cars, or sun roofs, or electric seats (all things that take away from headroom). Despite the low mirrors and low roofs, I like that I can walk through the doors. Yesterday my son and I walked around town and I suddenly realized there was no staring.. quite the opposite. I knew nobody around me... no one was pointing, no children cowered, no clerks hid behind newspapers and stole peeks at me. No one tried to sneak up to me and touch me to see if I was real... no crowds scattered, no one make a 'tisk tisk tisk' sound as if to say 'he is a giant who will eat my children'. No one even noticed I was there. It was a nice change. So are concrete floors marble benches. We got a furlough car today! After months of craigslist hunting on my dad's part and the generosity of others to help us afford it... we found a very good deal on a 2000 Chrysler Town and Country. LOW mileage... in good shape. the ad on craiglist was a mistake for a lot less than the car was valued at so we ended up buying it at far below blue book, FROM a dealer! Which means, if it's taken care of, we can resell it when we're leaving and get a good portion of the money back, OR keep it in the family to be used on future furloughs. PRAISE GOD.. patience and timing along with hard work and study brought us a very very good deal. Now please be praying that we do not get into any mishaps so that the car retains it's value. thanks to all who prayed for us. We're completely plugged back into the Matrix now.... on a budget, but still very effective. Today was definitely a day of loving technology and civilization! however the financial complexity of living in California hit me hard yesterday. There are so many choices and so many fees and taxes, it's hard to decide on a purchase for me. There are things we need to procure for our return, but I've no desire to go 'shopping' at all. I think it was my 'reality' check. Fees and taxes and..... I'm missing the simplicity of PNG. One car I borrowed had a bad shock mount... this happens a lot in PNG and I know the guys who could have fixed it (thanks autoshop).... but here, I don't know anyone who could fix it. -still need a car, one was offered and I loved it, but I didn't fit in it. -we're meeting with a missions committee tonight, please pray that it goes well, that we communicate well and clearly get across the need for Bible translation in PNG. "but I'm keeping the box to send this to PNG"
alas, it turns out that it's a fee for funding their 'electronic dumping days'... in which you can discard old electronics... personally I'd like to see all these old electronics before they got dumped. I told the guy I had an iphone 2g. he said 'wow I'm sorry, you're the last one on earth who does." but alas he did not. Still I feel okay, he didn't know what a PAL signal was or what 240volt power was. 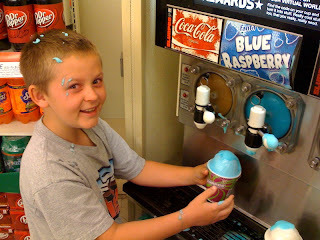 Today was 7/11 and as such 7-11 stores (convenience stores) were offering free slushies. The kids were begging for a slushy since we got here, so, as we passed by one we jumped at the chance. But the cups were all gone at 8pm. So, what's a dad to do? Shell out a buck per and get 4 'free' slushies. Apparently 400 customers came in asking for free slushies... thanks to yahoo.com who advertised it on their pop up page. Above my son got a bit too zealous with the slushy lever and covered all of us in blue slushy. Funny accident. Here's news to me... the current leap in television technology. Yes you 'read' about it 2 years ago... or well I didn't but someone did... but it's happening now. This is more of a heads up for my missionary friends who don't know like I didn't. 3d TV is all the rage right now. (Avatar the movie was 3d and I suppose it hasn't stopped). You can buy a box that will go over the internet and get all the free and pay (netflix) tv as you demand it. So long as you're cool with not watching currently broadcasted shows you don't have to pay for cable. -WITH a fast internet you can get your TV/Telephone/Email all online. get a fast internet connection. suddenly you have your phone, your flicks, your internet and it's costing a fraction of what cable alone would cost! and because it's month to month, no contracts... means you can come and go as you please! (skype works on some smart phones as well). So basically, you can setup a travelling everything, all you need is your laptop. The coolest part is that you'll be all cutting edge tech and be paying less than people who have lived here their whole lives! It's pretty easy and cheap. It's our second week back now and we've had a chance to catch up with a portion of our family and friends. A recurring theme seems to be going on amongst friends and family alike. -we felt it was so insignificant compared to what you're doing there. So for all those out there reading... tell us. Even bad news communicated tells us that you were thinking of us and that's an encouragement. Also please even if it's mundane things like 'what is your favorite ice-cream?' the email tells us that you took the time to write and we were on your mind. So please... don't let anything keep you from writing, we love it. New Terms to me that I heard yesterday during sunday church visitations. Death Grip - refers to holding the new iphone 4g in such a way that it negates the antenna and loses all signal. Also a bug in the software makes it appear as if you have more bars than usual. Tea Party - the grass roots political movement that now holds large meetings across the U.S. hoping to rally people to a new type of political thinking ... I think inspired by reaction to Obama and the country's desire to return to conservative thinking. we're constantly surprised by the the things that strike us having moved to the U.S. from PNG. We have this feeling every time we go somewhere that the people around us are people we we need to say "hi" to. The idea that we moved from a community where we knew everyone... to a place where we don't know anyone,... that feeling that someone walking into the room is still someone we should know. one of the private jokes of living in PNG is how bad the wood matches are. we have 2 brands available... Paradise and King wooden matchsticks. They rarely light, and quickly blow out in zero wind.... so we mock the matches. I'm guessing folks, it has to do with the altitude, since I'm down here nearly at sea level. Today we realized we never need to take the kids to Disneyland again, because the wonder they expressed at visiting SafeWay tonight, was more than they ever did at Disneyland! Pickles, you need pickles, come visit our WALL of pickles... bread n butter, dill, kosher, spicy, sweet, sliced whole, lots or little! I've had many a missionary tell me that visiting the American supermarket was the single largest culture shock for them.. some overwhelmingly so. But then, I saw the mountain of soda. Where we live, soda costs about $1.25 per can. So it's a rare treat, and you almost never drink more than one a day... if that. 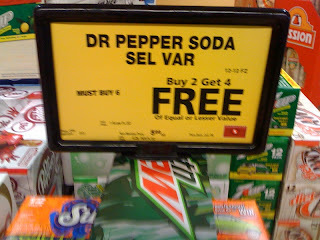 buy two 12 packs..... and get four 12 packs free... and then the words DR. Pepper and Diet Coke were on the list... I said 'kids, pick your favorite flavor soda'. 'wow.. dad that's like 12x12x6 ounces of soda dad....' he then went off counting the many ounces of soda. that's 72 cans of soda for - $12.00 = $.16 cents per can of soda... compared to our PNG cost of $1.25 per can. and boy oh boy the selection! there were tons of different types of flavors. Someone in the past 3 years went nuts with cherry flavoring... there is cherry flavored EVERYTHING now. anyway... we have some soda, AND we survived the supermarket with aplomb.